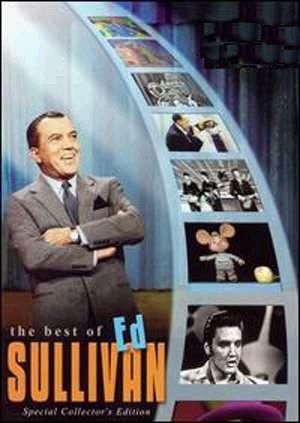 For those without comedic tastes, the self-proclaimed experts at Wikipedia have an article about Ed Sullivan. Ed Sullivan started his career as a sportswriter for the New York Jockstraps but, tiring of inventing gossip about players' locker room antics, he agreed to host Toast of the Town, a variety show, sometimes good but mostly unbearable, for CBS TV. His show, such as it was (and it wasn't much) was broadcast from CBS' studios at Area 51, a facility in the Nevada wastelands, near Desperation, which is rumored to be infested with illegal aliens. Later, CBS made him name the show after himself, disavowing any knowledge of him, the show, Area 51, or alien beings. Sullivan overdosed on Botox, which froze his facial features in a death-like rictus, earning him the sobriquet "Old Stoned Face." He also had a deadpan delivery style, which didn't help his audience realize that he was anything more than the animated corpse, or zombie, in a three-piece suit that he resembled. Many wannabe stars became stars as a result of their appearances on his show, including Bullwinkle J. Moose, Tom Terrific, and Krazy Kat. However, whenever a guest performed better than Sullivan liked, he banned the performer from ever apperaing on his show again. Those who experienced the wrath of Sullivan included Fidel Castro and Ronald Reagan, who had to enter politics afterward and never amounted to much, the former becoming the dictator of Cuba and the chief spokesman for its chief export, Cuban cigars, and the latter becoming first the Gipper and then president of the United States. Sullivan thought Elvis Presley "a decent young man," befriended the Beatles, and hugged Michael Jackson onstage to prove that Jackson liked men more than boys. He also enjoyed country crooners and invited Johnny Cash to appear on his show as The Man in Black. Retiring from show business, Sullivan entered the shoe business, designing oversize footwear for clowns, which he advertised on lesser shows than his own had been as "A really big shoo." This page was last edited on 21 June 2011, at 20:43.